The Bay checkerspot butterfly is a medium-sized butterfly that historically was found all along the Bay Area Peninsula. The bay checkerspot’s name comes from the black bands along the veins of its wings that contrast with its bright red, white, and yellow spots. Caterpillars hatch in the spring and spend the winter in a cocoon-like chrysalis which they emerge from as adult butterflies in late February to early May. The species is listed as threatened, but these butterflies are currently thriving on the rare serpentine grasslands of Coyote Ridge Open Space Preserve. 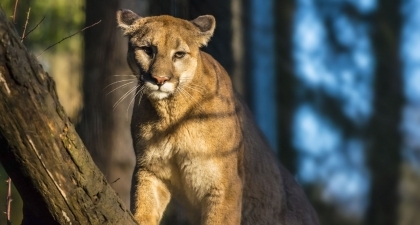 Mountain lions — also called pumas or cougars — are the top predator (other than humans) in the Santa Clara Valley. They live alone and are most active at night. Mountain lions are big: males can be more than 8 feet long and weigh over 120 pounds. Pumas can climb trees and may be found up to 50 feet up a tree. They primarily eat deer but also eat raccoons, birds, foxes, and mice. Cougars need large amounts of connected open spaces for hunting, water sources, and den sites. Mountain lion attacks on humans are exceptionally rare. If you encounter a lion, look big and stay with others. If attacked, fight back and be loud. Do not try to run away. Tule elk are the smallest elk in North America and are only found in California. They are distinguished by their white rump. Each year, males grow a new rack of antlers, which become progressively larger as they age. The breeding season, called the rut, occurs primarily in September, when males compete to mate and claim possession of a group of females. Tule elk were hunted throughout the 1800s and their population was also effected by habitat loss. 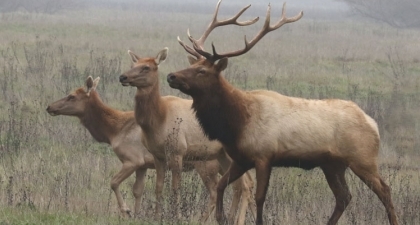 Now, 5,100 tule elk are thought to live in California, including some who can be found Coyote Ridge Open Space Preserve. Hard to spot, badgers are nocturnal, solitary, and spend much of their time underground. You’ll know if you spy one though — they are brownish, with short legs, an angular face, and a distinctive white stripe that stretches from the nose to the top of the head. General carnivores, badgers will eat rats, squirrels, mice, insects or birds. Skillful diggers, badgers burrow to catch prey but also to sleep, although they may switch burrows daily. 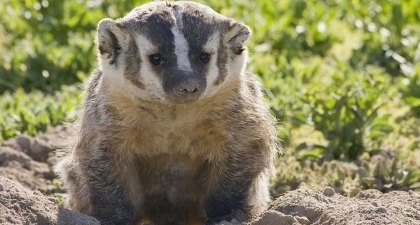 California’s badgers are American badgers, which live throughout the western United States. Interestingly, badgers are also found in Europe (called European badgers), but they are social, rather than solitary. Frequent preserve visitors often encounter deer, although they will likely run away if you are too close. The range of black-tailed deer extends from southern California to Canada, although individuals’ home territories extend only a mile or so. Deer prefer habitat that includes tree cover — for shelter and safety — and open grasslands or chaparral for tasty shrubs with new leaves, although they will eat a wide variety of plants, including oaks and berries. They are a key prey species for mountain lions. 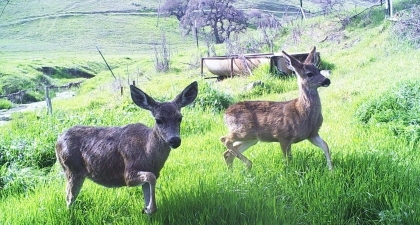 After rising for decades, California’s deer populations have been declining due to habitat loss. The Pallid bat is a beige-colored species of bat common in most of western North America, including here in California. They have wingspans of 15-16 inches, very large, forward-pointing ears, and piglike snouts. 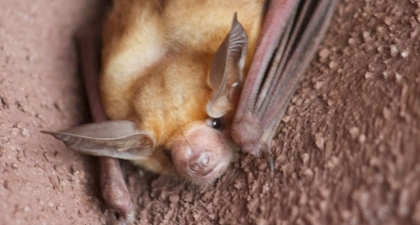 As nocturnal animals, Pallid bats emerge from their roosts 30 minutes to an hour after sunset and return home before dawn. They hibernate during the winter, which makes summer a great time to spot them as they fly close to the ground looking for insects to eat. Their babies are born in late spring, and by July or August they are already able to fly and find food on their own. The coyote is a member of the canine family, along with wolves, foxes, jackals, and domesticated dogs. They resemble small German shepherds, but with much larger bushy tails, long snouts, and pointed ears. They are grayish-brown or yellowish-grey with white throats and bellies. 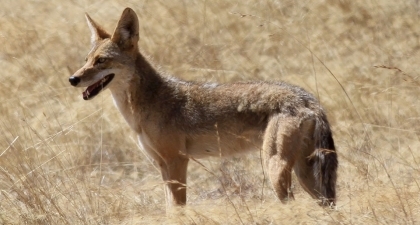 Unlike wolves that form large packs, coyotes usually hunt individually or in pairs. Most of a coyote’s diet consists of small mammals, but they will eat almost anything - including fruit, snakes, insects, animal remains, and even garbage. Coyotes can be active during the day or night, but you are most likely to see them at dawn and dusk. Bobcats are a species of small wild cat native to California and found throughout the United States. 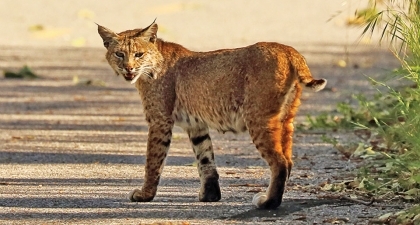 Bobcats can live in a variety of habitats across the country; in Santa Clara County they are found in oak woodlands, meadows, and rocky hills. These carnivorous cats eat a variety of small animals, including rabbits, mice, and birds. Kittens are usually born in the early spring, in litters of 2-4. Bobcats are solitary animals and mostly nocturnal, preferring to avoid human interactions. However, you may be lucky enough to spot one in the Llagas Meadow or Catamount Trail at Rancho Cañada del Oro Open Space Preserve. 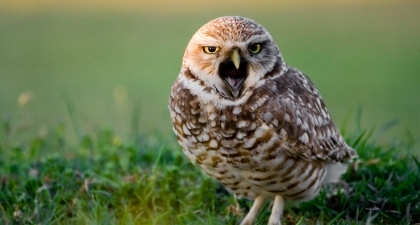 Burrowing owls are found throughout the western United States in open grasslands, although their population has declined due to the loss of open spaces. Visitors to Sierra Vista Open Space Preserve may be able spot these 8-inch tall birds, which have brown-tan splotched feathers and bright yellow eyes. The owls eat a variety of insects and small reptiles including grasshoppers, beetles, crickets, and lizards. Females spend one month incubating about eight eggs each year. During that time, their male partners bring them food. Acorn woodpeckers are primarily black, with patches of white on their faces and wings, with a bit of red on their heads. They are found in oak woodlands along the Pacific coast, from Washington to Colombia in South America. 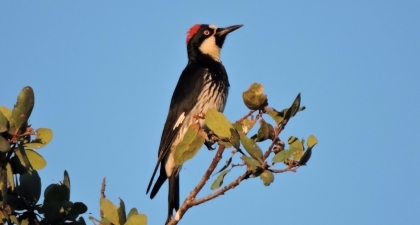 True to their name, acorn woodpeckers eat acorns, which they stash in holes they drill in trees. Some of these holes contain thousands of acorns! They also munch on flying insects. Woodpeckers live in communal groups of about a dozen individuals, who contribute by gathering food and raising young. The breeding relationships are complicated, with several males and females mating in each group. Yellow-billed magpies are primarily black birds, with long tail feathers, white sides, blue iridescent wing and tail feathers, and their namesake yellow-bill. Although species of magpies are worldwide, the yellow-billed magpie is found only in a small sliver of California’s central valley and coast range, where it lives in oak woodlands. The species is thought to be at risk from climate change due to its restricted range and specific habitat needs, which include mature trees and open grassland. They primarily eat insects such as grasshoppers. Yellow-billed magpies build domed nests out of sticks and mud in a tall tree — about 50 feet off the ground. Have you ever seen several big, dark birds flying in slow, wobbly circles? Meet the turkey vulture! 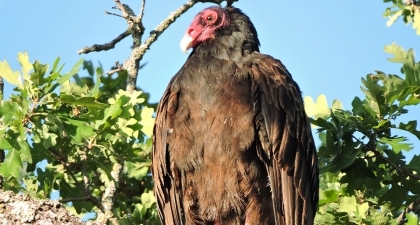 With huge, dark brown bodies and naked pink or red heads, these common vultures are easy to identify. As carrion birds, turkey vultures don’t kill their own prey, but rather eat already-dead animals. Their feeding habits, large size, and unusual appearance may make them seem scary, but turkey vultures are essential in keeping the environment clean of animal remains. They can be seen at our open space preserves all year round, but you’re most likely to spot them on sunny days. 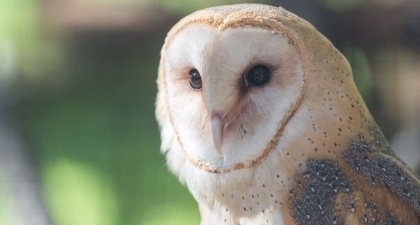 Barn Owls are pale birds with white faces and bodies and tan heads, backs, and upper wings. They have long legs with strong talons, round heads, and dark eyes on their heart-shaped faces. Barn Owls are practically silent, flying low across open lands to catch small rodents to eat. These owls have very good low-light vision, but the Barn Owl’s most impressive skill is its ability to track its prey by sound alone. Barn Owls nest in a variety of locations, including tree holes, cliff ledges, caves, abandoned buildings, and – you guessed it – barns! You can see them leaving their nests after the sun goes down. The red-tailed hawk is a large species of native hawk that thrives in the open grasslands, rolling hills, and oak woodlands of California. Most of these hawks are rich brown when viewed from above and pale when viewed from below. Not surprisingly, the short, wide tails of adults are a rusty red color. Their broad wings allow for high soaring as well as quickly swooping down to capture prey. Their diets mostly consist of small mammals that they hunt in open areas. 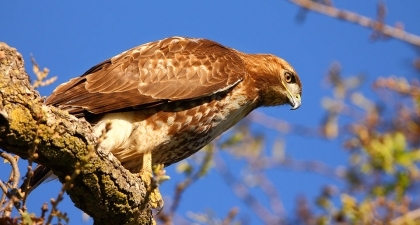 Red-tailed hawks prefer to perch in high spots – you may likely see one sitting in a tall tree or on a telephone pole. These birds are active year-round and can be spotted in all open space preserves. The Anna’s hummingbird is a medium-sized and stocky species of hummingbird, but only weighs 0.1 to 0.2 ounces when full-grown. Anna’s hummingbirds have green backs with greyish feathers below. Like many other species of birds, the males are more brightly colored - they have iridescent red or pink heads and throats, which the females lack. 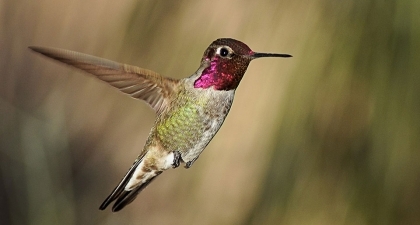 These hummingbirds are common across the West Coast and found in a variety of habitats including oak woodlands, chaparral, scrub, parks, and gardens. You may hear the buzzy or scratchy song of the male hummingbird when he is perched. Their diets consist of nectar and insects as well as the sugar water found in human-made hummingbird feeders. 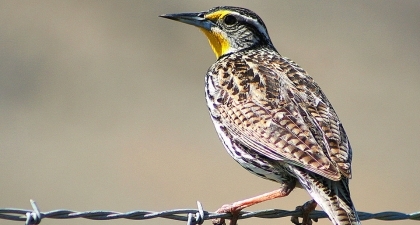 The Western Meadowlark is a robin-sized songbird with a white and brown spotted back, a bright yellow belly and chin, and a black “bib” on its chest. Its name gives away its habitat, for these birds love dry, grassy meadows where they can find insects and seeds to eat. They nest in the grasslands of Coyote Valley and Coyote Ridge open space preserves. If you can’t find one perched, their white outer tail feathers make them easy to spot when they fly. In the spring, you can see the males singing from high bushes or fence posts – listen for the bright, whistling warble. 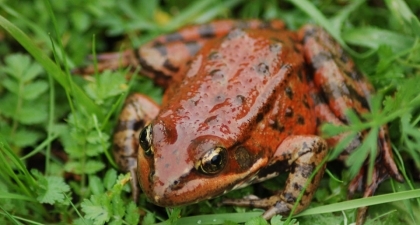 Red-legged frogs are 2 to 5 inches long, brown or olive-colored, with red on parts of the belly and legs. These frogs are classified as “threatened” under the federal Endangered Species Act due primarily to the loss of wetland habitat, although they also face threats from non-native bullfrogs. They are found in Sierra Vista and Rancho Cañada del Oro open space preserves, but are active primarily at night so visitors are unlikely to spot them. During their winter breeding season, females can lay as many as 3,000 eggs in shallow water. After hatching, the tadpoles mature — or metamorphose — into frogs about five months later. 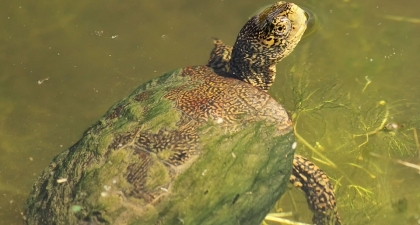 The western pond turtle lives in wetlands, ponds, and streams and can often be spied in the spring, summer, and fall sunbathing on a rock or log. It may spend the winter buried in a shallow dugout in the woods. They are approximately 5-6 inches long and olive or brown colored. The western pond turtle is found from Oregon to Baja California primarily west of the Sierra Nevada, although they have lost habitat due to development and the arrival of non-native bullfrogs and turtles such as the red-eared slider. They eat worms, aquatic plants, small fish, and insects. Rattlesnakes are the only type of venomous snake found in the Santa Clara Valley. You are most likely to spot one on a hot day when they may be sunbathing on a trail or exposed rock. They have triangular heads and chunky olive or tan striped bodies. Their tails have a set of rattles at the end, made of keratin, the same material found in your fingernails. Snakes vibrate the rattles when alarmed and may also hiss. Be warned: Rattlesnake venom is highly toxic. 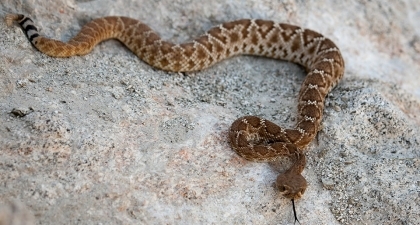 Rattlesnakes eat a variety of small mammals, lizards, and birds. They hibernate during the winter. 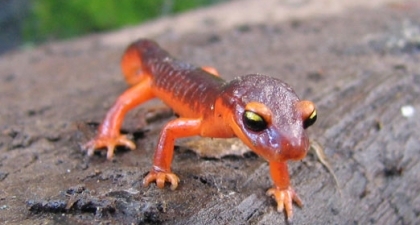 The yellow-eyed Ensatina is an orange-brown salamander that is about 5 inches long. These salamanders have no lungs — instead they breathe through their skin and mouth. That’s why you are mostly likely to spot them in moist spots under fallen branches or in tree cavities, although they may be on a trail following a rain. Providing homes for creatures like Ensatina is one reason it is important to leave downed trees undisturbed. They eat worms, beetles, spiders, and a variety of other invertebrates. Females lay around 12 eggs on land in the late spring, which they guard until the babies emerge in the fall. Western fence lizards are about 3 inches long with bits of blue on their bellies. Males are often observed doing a push-up like display to defend their territory and to attract females. Lizards are a staple food of snakes and birds of prey like hawks. 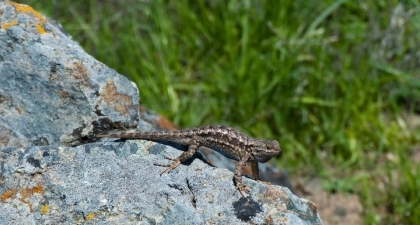 Western fence lizards, a subspecies of the coast range fence lizard, have an interesting relationship with Lyme disease: Their blood contains a protein that kills the bacteria that causes Lyme disease. However, the lizards are a key host for ticks that carry Lyme disease, so there are more ticks in western fence lizard habitat. Garter snakes are slender, medium-sized snakes found throughout most of California, including the Santa Clara Valley. 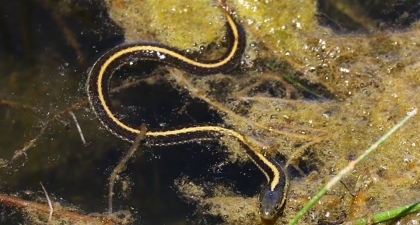 With a sharp eye, you might be able to see one quickly slithering through the grass, although they are well camouflaged with their vertical stripes of yellow, red, black, and/or white. As a cold-blooded animal, the garter snake keeps its body temperature warm by sunbathing during the day and returning underground when the sun goes down. They give birth to live young between July and September. These snakes eat a wide variety of prey, including small mammals, amphibians, insects, and worms - while they are food for mammals, birds of prey, and larger snakes! 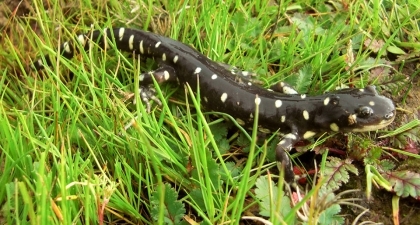 The California tiger salamander is an endangered amphibian that thrives in Sierra Vista Open Space Preserve, thanks to its ponds and grasslands. These 7-to 8-inch-long salamanders are dark brown or black with white or yellow spots. They have small, protruding eyes, and wide mouths that appear to be smiling. During the dry months, the California tiger salamander lives underground in burrows made by other animals, such as ground squirrels. When the wet season begins, they migrate to ponds to breed. You are most likely to spot one during a rainy night. 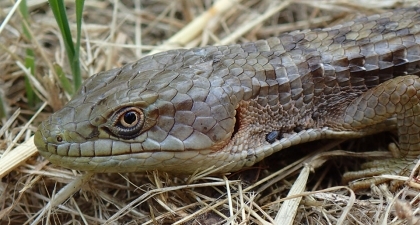 The alligator lizard’s name comes from its bony scales, large head, elongated body, and powerful jaw. These lizards have short legs and move with a snake-like, undulating motion by using their front legs to pull their belly along the ground. Alligator lizards have very long tails which can easily break off when threatened, a defense behavior exhibited by many lizard species. They can be found in a variety of California habitats, including grassland, chaparral, and oak woodlands. Alligator lizards usually mate in the spring and lay eggs that hatch in late summer or early fall. 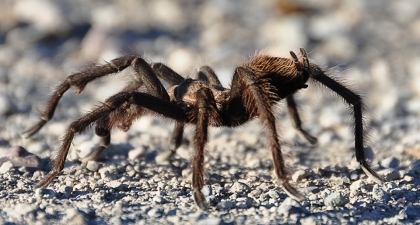 The California brown tarantula is brownish-black and can grow to 5 inches long. Although they may look intimidating, a tarantula’s venom can subdue only beetles, grasshoppers, or small spiders — they don’t harm humans. The spiders live underground and are primarily active at night. In the fall, males emerge and wander in search of females. You are most likely to spot them in Rancho Cañada del Oro or Sierra Vista open space preserves. When a male finds a female’s silk-lined burrow, he knocks to announce his arrival. Males die within weeks of mating, but females can live to be 25 or 30 years old.